A large majority of Filipinos want President Rodrigo Duterte to assert the country’s territorial claims against China in the South China Sea, according to a survey released on Thursday. Polling data commissioned by the independent Stratbase ADR Institute found that 73 people want the government to step up its territorial claims as China continues to expand its naval and coast guard presence in the area, while also mining it of its natural resources. Just 7 percent of respondents were against the idea, while 17 percent were unsure. 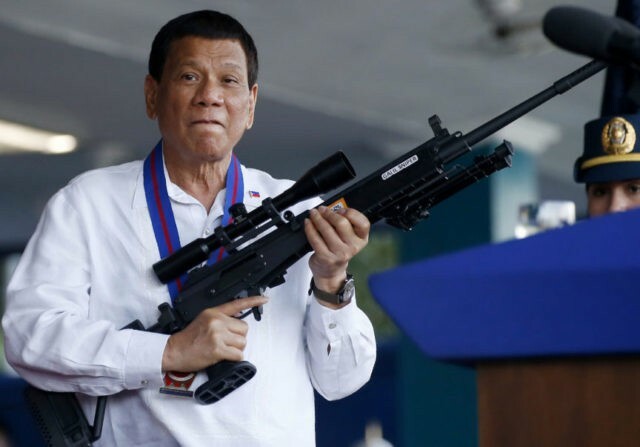 The data also revealed that 36 percent of Filipinos believe Duterte should protest China’s ongoing militarization of the artificial islands within the territory, while 22 percent said that the Philippines should strengthen military ties with Western allies including the United States, Japan, and Australia. The survey was released two years after courts ruled against Beijing’s territorial claims in the South China Sea, after the previous government took the case to an international tribunal. Since coming to office in 2016, Duterte has become the target of internal criticism for his failure to openly oppose China’s ambitions, instead pandering to Beijing in an attempt to improve trade ties while increasing support and investment, even joking that the Philippines could become a Chinese province. Duterte’s administration has repeatedly insisted on its commitment to preserving its territorial claims. His secretary of Foreign Affairs Alan Peter Cayetano said in May that the president was prepared to “go to war” over the issue. The survey also found that 74 percent of Filipinos have more trust in the United States than any other nations, compared to just 17 percent who have greater trust in China.